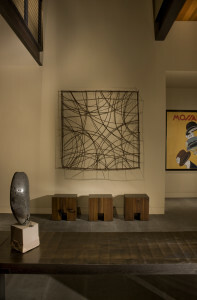 David Wards natural stick art work has been recognized more and more for it’s simplicity and subtle shapes of the branches he uses and has begun to carve out a place in contemporary interior design in the national media. David’s modern organic stick art and lighting has been featured in high end magazines around the US and just recently in the Home and Design section of the San Francisco Chronicle. The simple beauty he creates and follows in each piece draws the observer into a calmness and meditation. He collects his materials from sacred land of the Washoe tribe in Nevada and other locations in Northern California. David’s artwork can be purchased directly from the artist or at Spirit Gallery in Truckee Ca or Michael Taylor Design in showrooms around the country. To read what others say about David’s organic stick art work click the links in the articles below.